Idlis are steamed savory cakes served as traditional breakfast dish in south Indian households. They are made with fermented batter of rice and black gram. Since fermentation takes time, one needs to plan a day in advance. 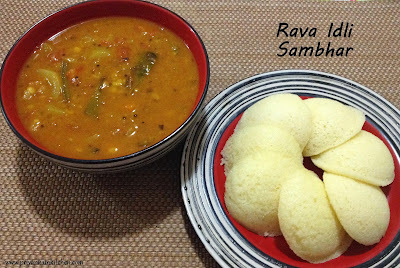 Therefore I prefer to make instant Rava Idlis whenever I am bored of usual stuff and need a change. Though traditionally Idli is a breakfast dish, but it makes up an excellent healthy meal option at any time of the day. Idlis are generally served as combos, either with chutney or sambhar. I prefer to serve them with sambhar and coconut chutney. 1 1/2 cup of chopped vegetables ( Bottle gourd, carrot, and cauliflower) You can use vegetables according to your taste and preference. Method: Idlis can be made on cooktop as well as in microwave. Sharing both the methods. In a bowl take semolina, add salt and yogurt, mix well. Add water, mix again and leave for 2-3 minutes. Grease Idli molds. Add 1/4 cup of water in the base. Add Eno to batter and whisk well. Pour batter in Idli molds. Don't over fill. Place the molds in microwave and cook covered for 5 mins for first lot and 4:40 minutes for subsequent lots. If you are using a bigger mold, cooking time will vary. Let it stand for 1-2 minutes before taking out of molds. Grease Idli molds. Add 1 cup of water in the base of a broad saucepan or idli cooker. When water starts to boil, place the mold in saucepan and cook covered for 10-15 mins. Do knife check to confirm they are done. In a pressure cooker add washed pigeon peas, vegetables, turmeric, salt and enough water. Close the lid and cook on high until first whistle, then cook on low for 10 mins or until vegetables turn very soft. Open the lid when pressure is released. Crush few vegetable pieces with laddle if you also don't prefer big pieces like me. Otherwise just add boiling water to adjust consistency. In a pan heat oil. When hot, add mustard, curry leaves and green chilies. Fry for 30 seconds. Add onions and fry until they turn translucent. Add sambhar masala and mix well. Add tomatoes and fry until it starts to leave the edges of the pan. Add tamarind and 1/2 cup of water. Bring to boil and add to pressure cooker. Cook until everything comes to boil.